Download Free File comparison tool. Turtoise SVN is Free and it can provide file comparison facility same as popular beyond compare tool. 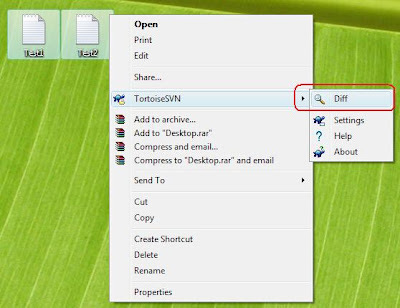 Turtoise SVN is popular file versioning tool, but it can also be used for file comparison and its Free. For example purpose i have created two sample file to compare. Step 1: Download and Install SVN. Step 2: Choose Files to be compare. 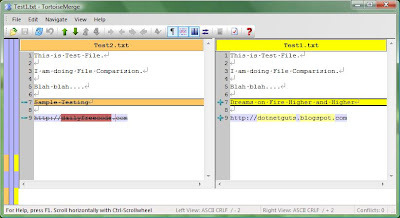 For this example i have created two sample text file. Note: You can compare any two file it can be .doc file, .xls file, .xml file, .cs file or any. Step 3: Select two file and press cntrl key and press right mouse click and choose "Diff" for finding difference between two files. Step 4: Following screenshot shows difference between two files. Step 5: You can replace text block and manipulate file as per your wish. Right click the text from file you would like to use, and choose option "Use this text block" in order to use that text block for both the files.